Steven Winn and his wife, Sally, held out for as long as they could. When the San Francisco couple finally gave in to their only child Phoebe’s pleas for a dog, they adopted a scraggly terrier mutt from a local animal shelter. The new family pet, Como, turned out to hate men—especially the author—and proved to be a cunning escape artist. Traumatized, single-minded, and exceptionally clever, Como was bent on breaking Winn’s sanity and self-respect, his bank account and his heart. 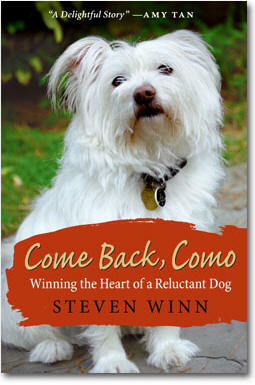 Come Back, Como is the story of one man’s hilarious and poignant quest to win the trust of a dog who wanted nothing to do with him. With humor and pathos, Winn describes the maddening but ultimately rewarding effects Como had on his family, the misadventures and ordeals and terrifying events he and his dog endured together, and the greatest lesson Como taught him: that loving a dog can make us more human.